We really enjoyed our 4 day tour of Tibet. You did an excellent job of arranging everything. I do not feel that your work or the tour could have been any better. We were pleased with the various tours, the vehicle transfers, and the hotel. I was going to write you to thank you for your great help and assistance. I had university student graduation when I returned, so was very busy myself these past few days. The trip was fantastic!!!!! The driver and guide were very helpful and kind. I learned a lot and saw so much that I still think it was a wonderful dream. I truly appreciate your patience and cooperation in getting me the right trip schedule and my son withdrawal at the last minute. I am visiting my son tonight in fact to share my photos and experiences with him. I expect he will be contacting you soon. When he does please assign the same driver and guide to him, again, they were great. I have a photo that it all up. Truly, a one in a life time trip. Thank you all. 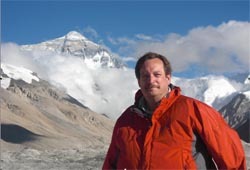 I just wanted to let you know that we just completed a wonderful tour of Tibet and EBC. Everything worked out perfectly. We had a good group to travel with and had fun making new friends. Pashang did an excellent job of sharing the Tibet story as well as making sure all logistics were satisfied and taken care of. Most of all, we lucked out on weather. The two days at EBC were cloud free with beautiful blue sky and sunlight shining on Everest. At night the sky was so full of bright stars and the Milky Way just "popped out" in the night sky. I just wanted to take a moment to compliment you on the trip to Tibet. It was one of the best experiences I have yet to have. Our guide, Pasang, did a fantastic job educating us about the local culture. He was always professional, courteous, upbeat and a very nice person. ; My one recommendation would be to have a bus that was built to handle the rough roads on the path to Everest. Other than that the trip was exceptional. 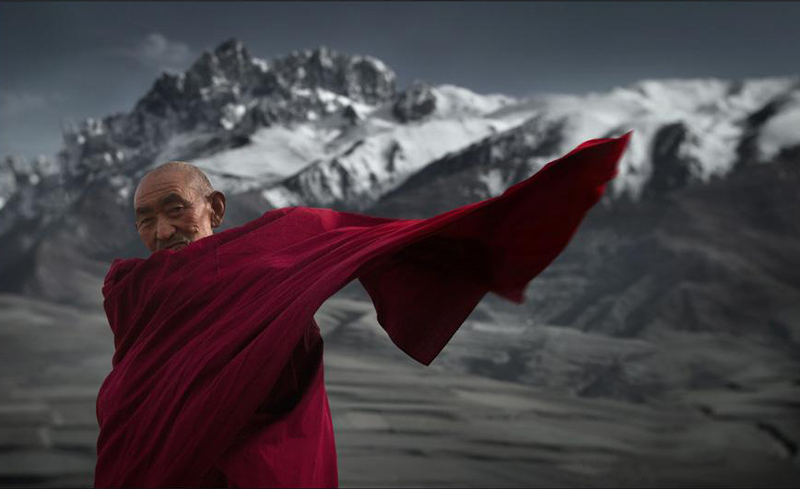 I will always remember my time in Tibet. I wanted to tell you how much I enjoyed my trip to Lhasa. The train went very well and the Mandala Hotel was very comfortable and friendly. 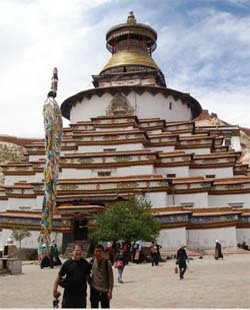 Nima, my guide in Lhasa, was a high point of my visit. He is knowledgeable and friendly. He really went out of his way to make my visit interesting and enjoyable. I thought that he was terrific. I am good and I hope you are good too. 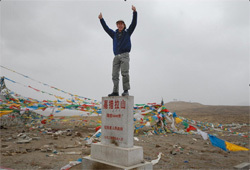 I am very satisfied with my tour and visit in Tibet. It was a great experience and I do not regret visiting this interesting place. 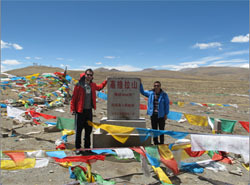 Since I did not know Access Tibet Tour, I took a chance in doing business with your company and you have been fantastic. Every thing was well organized and you, in particular, took very good care of me, making sure all the paperwork was well prepared. You regularly communicated with me and this made me very comfortable that you were a professional tour company. The guide was excellent. Her English was almost superior to mine. I was very impressed with her. She, also, made sure I was comfortable in every area of the tour. You have all done a great job to make sure this visit to Tibet was an outstanding experience for me. 1. The advisor i contacted is professional, attentive, friendly and you can tell she really cares about her job and her clients. She was so patient with our many questions from different sides of the world and was extremely helpful in tailoring our tour to suit our needs. 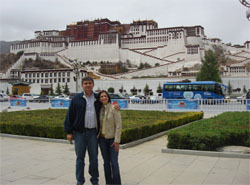 She chose good accommodation for us and in particular in Lhasa where we specifically asked to be near the Barkhor Square. 2. Our tour arrangements were very good. It was great to be able to take your basic itinerary and add what we wanted to it and also get to see as much as we could in the short timeframe we had. We thought our guide, Lobsang was extremely good - very patient and flexible with us. As it was only the two of us on the tour, he was very helpful in suggesting things we might like or letting us know if it wasn't advisable to visit somewhere (eg. Drepung Monastery in Lhasa was undergoing renovations so we went sourvenir shopping instead and toured the Tibetan carpet making facility). Our driver was also very good and very friendly and we both enjoyed our travels with them very much. 3. We are willing to recommend their service to those who wish to come to Tibet - in fact I already have!" Just letting you know we had a great trip in Tibet and in the rest of China. Tibet is an amazing place, and everything when well. (except the hotel in Gyantse - The toilet seat was broken and they had taped it up with sticky tape - they eventually changed our room - but then there was no pillow cases on the pillows.) The Tour Guide and driver were great. Thank you very much for organising this trip for us. For future Tibet travelers, I like to tell you how great our Tibetan travel guide Tsering Lhakyi is. She speaks fantastic English and has a great personality, know the local culture well, particularly in the history & Tibetan religion. She gave us good advice in shopping, food/restaurant & took us to a farmer house for a tour. We took a 5 days tour in May 2010. I highly recommend to ask her as your tour guide. Our trip to Tibet was inspiring but not relaxing, as expected. The trip to Shigatse offered many beautiful panorama's, we did enjoy it, but in our view, there are more possibilities for short stops (for looking around and taking a picture) than we have had. As I am involved in agricultural projects in China, I thank Tsering for the stops at some agricultural sites, in particular the interviews with greenhouse farmers. Besides the monasteries in the program, we visited a nunnery with Tsering, which was one of the most relaxing moments in our tour. Summarizing, we have enjoyed our visit to Tibet and will advise other people to do the same. 1. You were excellent in terms of getting back to me on time and helping me with everything - EXCELLENT! 2. The tour was fine - our guide Pasang was absolutely fantastic, the best guide I have ever had and so knowledgeable, warm, friendly, and helpful. 3. I would definitely recommend your service. My buddy Ayush and I had a great time in Tibet - Everest was truly unforgettable. Thank you very much for helping us organize such an excellent tour. Please see my feedback below. My friend Ayush will send in his feedback too. Our advisor Lydia is absolutely great. Responses were quick, and in enough detail and clarity. The tour arrangements are very nicely done. Friendly, helpful, and not trying to make the tourist try the most expensive deals! That was very nice - to attempt to tell the tourists which type of travel arrangements would make them reduce costs. One improvement may be to reduce the number of visits to the monasteries. I'm not being disrespectful at all. While we appreciate Tibetan culture, we found that after 2 monasteries, we could not tell the difference or understand the various significances. This is similar to the Hindu temples in India - not much variation to a foreigner if he/ she visits more than 2-3 temples. Our contactor Lydia is professional, attentive, friendly and you can tell she really cares about her job and her clients. She was so patient with our many questions from different sides of the world and was extremely helpful in tailoring our tour to suit our needs. 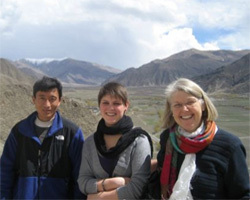 Lydia chose good accommodation for us and in particular in Lhasa where we specifically asked to be near the Barkhor Square. Our tour arrangements were very good. It was great to be able to take your basic itinerary and add what we wanted to it and also get to see as much as we could in the short timeframe we had. We thought our guide, Lobsang was extremely good - very patient and flexible with us. As it was only the two of us on the tour, he was very helpful in suggesting things we might like or letting us know if it wasn't advisable to visit somewhere (eg. Drepung Monastery in Lhasa was undergoing renovations so we went sourvenir shopping instead and toured the Tibetan carpet making facility). Our driver was also very good and very friendly and we both enjoyed our travels with them very much. Please pass on our thanks and regards to Lobsang and Berma! Our general opinion of Access Tibet Tour is very positive and we would definitely use your services again when we next visit Tibet. We are willing to recommend your service to those who wish to come to Tibet - in fact I already have! 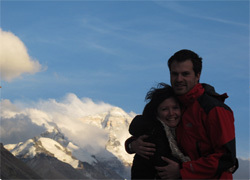 Thank you to all the wonderful friends we made along the way on our recent trip to Mount Everest in Tibet in April-May 2010 for making the trip really enjoyable. 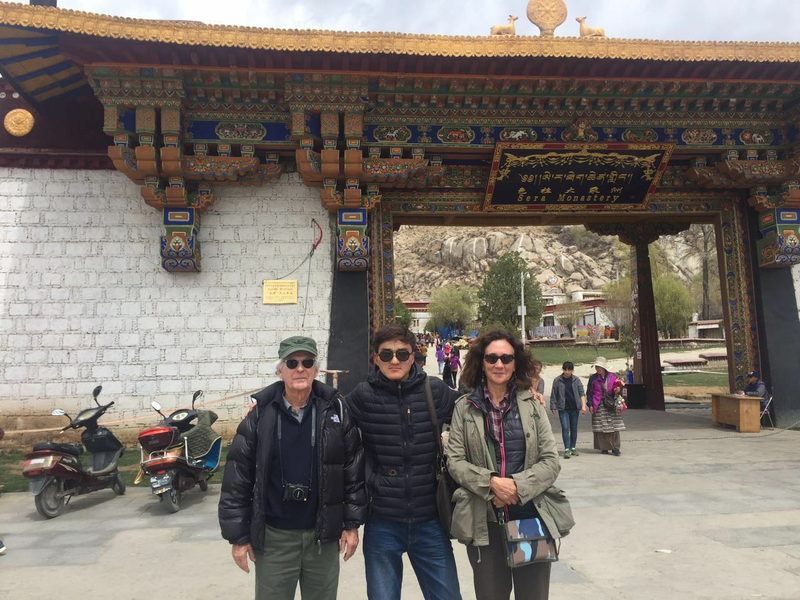 A special thank you to our expert guide Don Drop from Access Tibet tours for sharing his vast knowledge of the Tibetan people, landscapes, and religion and of course somehow he also gets the credit for the great weather which allowed us to clearly see Mount Everest! Also thank you to the Stanley Family for their hospitality while staying at base camp and to Katherine from Access Tibet Tours for always getting back with us during the planning stages and being flexible during our trip. Please reply to this e-mail so I know you received it ok as my e-mail address sometimes gets blocked and if you have any questions please feel free to ask. Itinerary: Lhasa - Gyantse - Shigatse - Mt. Regina and I made it safely across the Nepalese border. Thank you again for the great trip you organized for us. We had a very good time with Lung Dock and Dorje. They taught us a lot and showed us so many interesting places. Tibet was a great experience for us. Our operator Lydia's responses to our mails were extremely fast, friendly and helpful. We could not expect it any better! For the arrangement, in retrospect, maybe some more free time would have been nice. Apart from this, the arrangements were great, and individual changes were included readily. We are very content with the service ATT provide, except the pickup at Lhasa station was not as perfect as the rest because the tour guide was late. Apart from this: Great trip!!! And, we would like recommend to people asking about going to Tibet, actually, we already did recommend to several people we met along the way later in China. I am on the plane waiting for take off from Lhasa. You surpassed all expectations. I will contact you next year to plan adventure in China. Kashgar, Mongolia, Lijang or Guilin. This trip went very well & was well organized. Yeshi our driver was excellent as was Tsering our guide. Both were a great help & Tsering was very knowledgeable & obliging. They were also both always punctual. The content of the trip was really good, with enough variety to make it interesting. The hotels were marvelous especially the one in Lhasa. You also somehow managed to make sure that the weather was perfect. We enjoyed the train trips, Xi'an & Shanghai. The drive from Shigatse to Yanpachen was incredibly beautiful & is strongly recommended for further trips. 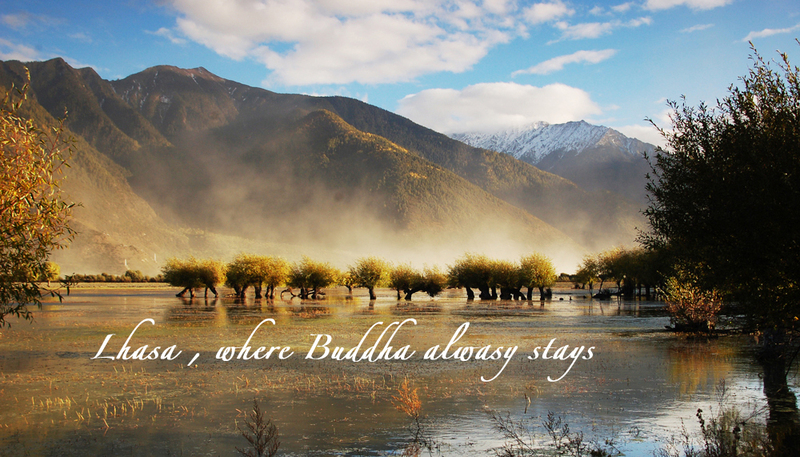 Tibet is a great place to visit, which we will definitely recommend to our traveling friends. We are fine. We had a good time in Tibet and love the place. Maybe next time we will venture deeper into the country. Thanks to the guide and the excellent driver. We arrived in Beijing last night. Thanks again for the quick response and assistance you provide that helps makes the trip memorable. Our adviser Bruce was very good. He answered all my questions and was helpful and courteous when I made alterations to the tour. For the arrangements, there were one or two things that we were not happy with but on the whole we enjoyed our tour. We would like to recommend the driver in Kunming. He was very helpful and made extra recommendations to our guide of things we may have been interested in seeing. Aaron, our guide in Dali was excellent. His English was very good and he went out of his way to show and explain things. Mr. Dai, the driver we had in Dali and Lijiang was the best driver we had. He was very safe and always courteous. The day on a Tibet farm was a big highlight on our trip. We thoroughly enjoyed our time with an ordinary Tibet family. Our guide in Lhasa was very thoughtful, caring and helpful. He helped us to enjoy our stay very much. Our driver in Tibet, Pamba, was excellent. He had very difficult terrain to drive over and he made the drive as comfortable as possible.